Scioto County Special Olympian Jacob Nele puts one in the bucket with an assist from Shawnee State University’s men’s basketball team. The 2019 Hardwood Heroes Celebrity Basketball Game will be Saturday, March 30, at SSU’s Rhodes Athletic Center. Excitement will fill the Shawnee State gymnasium next Saturday, when once again, the Scioto County Developmental Disabilities sponsors the Hardwood Heroes game. If you want to watch some local celebrities try to play basketball against the athletes of Scioto County Special Olympics, this may be the place for you. 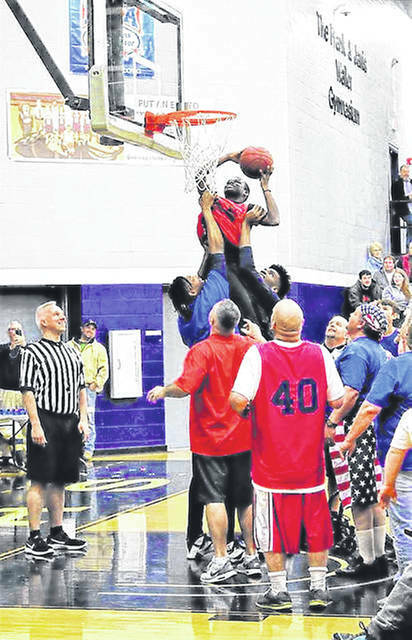 Scioto County Special Olympics’ athletes are ready to hit the hardwood against this year’s field of celebrities as part of the Hardwood Heroes Celebrity Basketball Game, which raises funds for local Special Olympics programming. The annual event, in its 11th year, will start at noon, next Saturday at Shawnee State University’s Rhodes Athletic Center. “All money raised at this event stays local and affects the lives of our friends, family, and neighbors,” said Community Relations Coordinator for Scioto County Developmental Disabilities and also, Scioto County Special Olympics Spokesperson, Lori McNelly. “When you give to Scioto County Special Olympics or take part in one of our events, you are part of something that offers opportunities in sport and physical fitness to folks you care about.” McNelly said that all of the proceeds stay local. This year’s event is said to have Scioto County Commissioner Bryan Davis teaming up with Keith “KC” Chatfield for color commentary during the game. McNelly said the event will have more than the basketball game going on, Saturday afternoon. The event will also feature a raffle. McNelly wanted to mention they will also be showcasing some art show with works by individuals served by Scioto County Developmental Disabilities, and karaoke between quarters, they will have concessions, split the pot, and raffles. “It will have something for everybody.” She said things for the day, would be going on for two or three hours. Presale tickets are available at Vern Riffe School for $2 each, while tickets will be $3 each at the door. Everything starts at noon. The game, sponsored by Scioto County Developmental Disabilities, rounds out March’s Developmental Disabilities Awareness Month events in Scioto County. The Hardwood Heroes basketball game seems to be a community favorite, so next Saturday would seem to be a good day to bring the family out to support the Scioto County Special Olympics.